Renewable energy zealots claim spiralling power prices and rolling blackouts are just ‘teething troubles’ as we ‘transition’ to our 100% all RE future. On their worldview, it’s a matter of when, not if, modern economies end up completely ditching ‘dirty’ coal-fired power plants, and otherwise wean themselves off fossil fuels, altogether. Trouble is, in places like notionally wind powered South Australia and Germany, the so-called ‘transition’ inevitably smacked into reality: the only thing inevitable about it, is more chaos, triggering a run of new promises and even bigger lies. Every time the facts trouble their fanciful narrative, the narrative shifts, yet again. Whether it be Elon Musk’s promise of mega-batteries (a $150 million wheeze that would power SA for all of four minutes), pumped hydro systems using seawater (the only hydro system using salt water predictably rusted to a halt on the island of Okinawa, a mere 17 years after it commenced operation) or dictating that power consumers stop being power consumers (whenever breezes drop to zephyrs and/or the sun drops behind the horizon). Germany has spent a colossal amount in its attempt to run on the sun and wind. However, just like everywhere else on the planet, the sun sets and the wind blows at its convenience, rather than at the convenience of industry and households. After a near death experience in January 2017 (when wind and solar power output collapsed for weeks and the grid nearly collapsed, too), Germans, and German industry in particular, got serious. Its power generators were forced to fire up mothballed coal-fired power plants and accelerated their efforts to build new and more efficient plants. Instead of transitioning away from coal, the Germans are transitioning back to the stuff. Despite the hype, Australia has never looked like transitioning away from coal-fired power. On average, coal-fired power satisfies more than 75% of Australia’s electricity demand. After sunset on a breathless 42°C summer’s day (when air conditioners are at full throttle), the figure is closer to 90%. 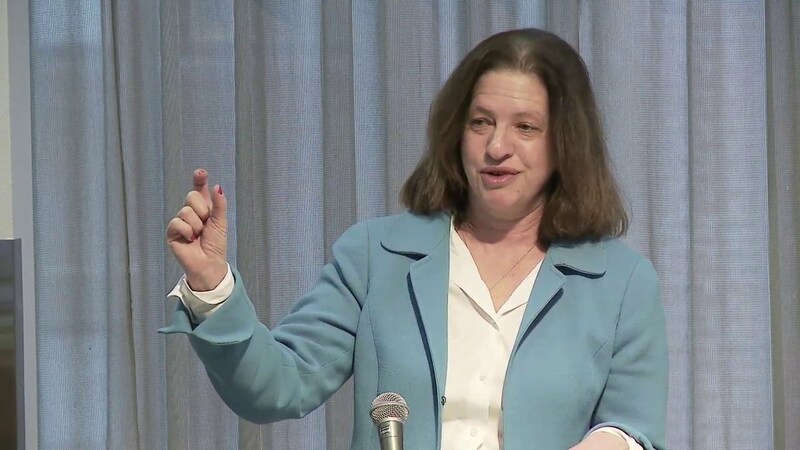 The Australian Energy Market Operator is headed up by eco-zealots, including Audrey Zibelman. Audrey jetted in from the USA on her mission to destroy Australia’s affordable and reliable electricity supply. Before that, she was well advanced on the same mission in New York State, and was set to do the same across the USA, when Hillary Clinton was whipped by Donald Trump. Correctly reading the tea leaves, Audrey packed up stumps and headed Downunder to extol the ‘virtues’ of nature’s wonder fuels here. Trouble for the all RE narrative is, that it’s another one of nature’s gifts that’s attracted Audrey’s attention. The nation’s independent energy market operator has called for Australia’s fleet of coal-fired power plants to be operated for as long as possible to prevent a future price shock in the transition to renewables, claiming the ageing plants will still deliver the cheapest electricity for the next 20 years. In a report commissioned by COAG into the energy and transmission requirements for the country, the Australian Energy Market Operator estimates the replacement cost of the generation capacity of the existing coal-fired network would be between $8 billion and $27bn by the mid-2030s. It said extending the operation of the existing fleet of coal-fired generators for as long as the plants were economically viable would be “the least-cost option” for an orderly transition to renewables. The report, while not advocating new coal generation, will have implications for the political battle between the government and energy giant AGL over the planned December 2022 closure of the Liddell power station in NSW, which the government argues could remain operational beyond that date. It is the second independent report in a week to also back the Turnbull government’s national energy guarantee and a technology-neutral approach to addressing the energy supply and pricing crisis. But it contains an implicit warning that the system could not afford another premature coal-fired plant closure like Hazelwood in Victoria. The AEMO report, to be released today by chief executive Audrey Zibelman, follows a report by the Australian Competition & Consumer Commission, which recommended the complete overhaul of the national energy market and suggested government underwrite new investments in generation, as well as setting a benchmark price for electricity. The report follows a cooling of tensions within the Coalition party room over the government’s energy policy with a partial backdown last week by the Nationals on their push for a new coal-fired power plant. Resources Minister and coal advocate Matt Canavan said they were not wedded to a new coal plant but coal-fired power still needed to be contained in the NEG. Some pro-coal Liberal MPs, however, are likely to seize on the report’s findings as a vindication of their push within the party room to invest in clean-coal-fired power as part of the energy mix into the future. AEMO’s report, which addresses recommendations adopted by the government from the Finkel inquiry in 2016 and is titled the Integrated System Plan, maps the cost and architecture of transmission and generation needed in the energy market over the next two decades. It claims the life of coal-fired power to deliver cheaper and reliable baseload power before the transition to a renewable energy future needs to be maintained for as long as possible. It also raises the risk of consumers wearing the transmission cost of connecting renewables to the grid if immediate action is not taken. “Immediate action is required to maximise the economic use of existing low-cost generation. Investment is also required to facilitate the development of projected new renewable resources to replace retired and retiring resources, and to provide essential system security,” the report says. “Collectively, the (coal) generators expected to retire by 2040 produce around 70 terawatt hours (TWh), or 70,000 gigawatt hours (GWh), of energy each year. “This is close to one-third of total NEM consumption. In addition to providing critical energy production and dispatchable power, conventional generators have also traditionally been relied on to provide essential grid security services, such as inertia, system strength, and frequency control. However, it raises concerns that transmission costs will rise significantly as more renewable energy comes on stream, with connecting infrastructure required to connect it to the national grid. Immediate action is required, it says, to upgrade the transmission network, which is already one of the largest interconnected networks in the world. This involves projects to be completed by the mid-2020s for new transfer ­capacity between NSW and Victoria of 750MW and to increase transfer capacity between Victoria and South Australia by 100MW while capacity between Queensland and NSW should be increased by a further 378MW. Immediate costs of transmission upgrades would be between $450 million and $650m. Longer term plans include renewable energy zones strategically located to minimise transmission costs. “It will be important to retain existing coal-fired generators until the end of their technical life to maintain reliability,” the report says, adding that replacement costs are “significant” and “unavoidable”. Audrey’s babble about Australia being well on its way to an ‘orderly transition’ to an all renewables powered future is a little like St Augustine, who wanted his Lord to make him chaste, but not yet. Warm fuzzy emotion is no substitute for the laws of physics and economics. Wind and solar have had the best part of 20 years to demonstrate their purported ‘virtues’ as meaningful power generation sources. They’ve demonstrated that they are meaningful subsidy generation sources, and community wreckers, but not much else. More than $20 billion has been siphoned from power consumers and taxpayers to fund this job and economy wrecking nonsense, so far; the Federal government’s Large-Scale RET is designed to deliver another $40 billion to large-scale wind and solar between now and 2031. Anyone claiming to be “technology agnostic” in 2018 must’ve flown in from another planet. The idea that we’re kindy-kids baking our very first cake and can pick and choose our ingredients with liberal abandon, oblivious to the results, leads to the nonsense about not favouring one energy source over another, and that every form of generation has ‘its place in the mix’. It’s pretty obvious that people like Audrey occupy a parallel universe where the sun never sets and the wind never stops blowing; where you can wave a magic wand and conjure up mythical mega-batteries or pumped hydro storage, in an instant (all for free, of course); and that connecting thousands of wind turbines and millions of solar panels – speared and splattered across the Australian outback and spread far and wide and thousands of kilometres from power customers – to an already groaning network, will cost peanuts. The truth is that Audrey and her gang have been spooked by the pace at which electricity prices jumped over the last three years. Australia’s wind and solar capital, South Australia still tops the international list for retail power prices, with worse to come. As any bureaucrat knows, your longevity depends on performance. The AEMO is having a hard time explaining away spiralling power prices; and the buck stops with Audrey. Telling us that our existing fleet of coal-fired power plant provide the most reliable and affordable power, is hardly news. We knew that. Prior to mandated renewable energy targets, feed in tariffs, and subsidies to wind and solar, Australia enjoyed the lowest power prices in the world. All thanks to cheap and abundant coal-fired power. What most people fail to appreciate is that the policies pushed for by people like Audrey, and executed with relish by her and others, are deliberately designed to destroy the economic viability of reliable and affordable power generators. What’s really rattled Audrey is how immediate and effective those policies have been; and it’s all happened on her watch. Wind and solar don’t compete with coal and gas; they never have, they never will. Here’s the real news Audrey: sunset is a thing; calm weather is a thing. These are not planetary or meteorological oddities. The Australian’s Terry McCrann tackles that stunning revelation below (with a little help from STT, AEMO and Aneroid Energy on what happened in SA on 9 July). The basic uselessness of wind and solar but especially wind as mainstream electricity generation sources should be obvious. At the risk of repeating myself: when the wind don’t blow… and, well, you know the rest. So why is solar marginally less useless? Because at least we know the sun don’t shine at night — at least we can, to use a word very loosely, plan for that; the wind, though, can choose not to blow at any time, 24/7. This statement, yet again, of what should be the bleeding obvious is not, though, the central point of this commentary. It is the way that intermittency — unpredictable as to both time and duration — requires massive overinvestment in generation capacity. Again, that is or should be a statement of the bleeding obvious. What though is most decidedly not obvious, what has received no serious discussion, what though doesn’t seem to be even dimly — and that word is used advisedly — considered, far less understood, are two utterly destructive consequences of that overinvestment. The first is to destroy the business functionality of generation. 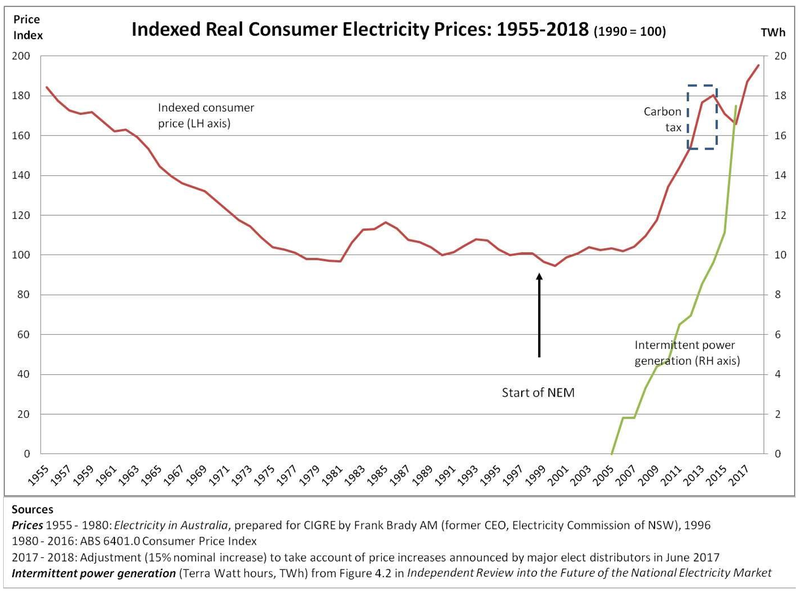 The second is the way the electricity market is fundamentally compromised, leading to both spectacular highs and not-quite-so-spectacular lows in price, but irresistibly to higher prices on average. 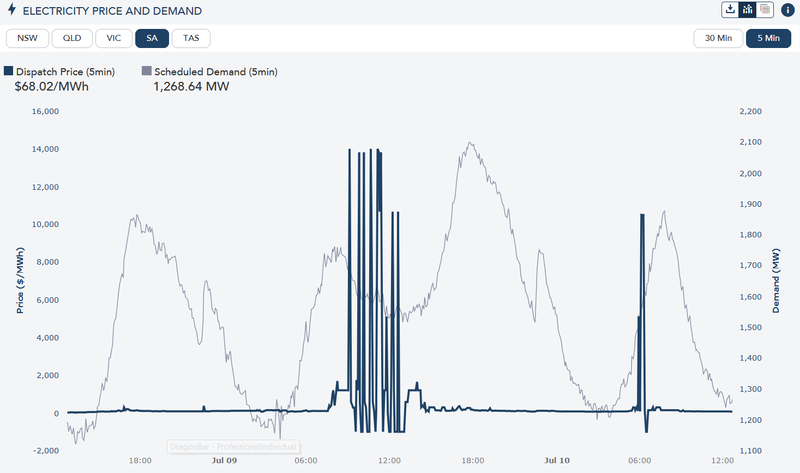 These consequences are already playing out in days like earlier this month in South Australia when the spot price bounced around the $14,000 per MWh ceiling and averaged $701.60 all day. And also, not exactly incidentally, at the opposite end: when the price went below $10 a MWh and averaged just $44.89 a MWh. 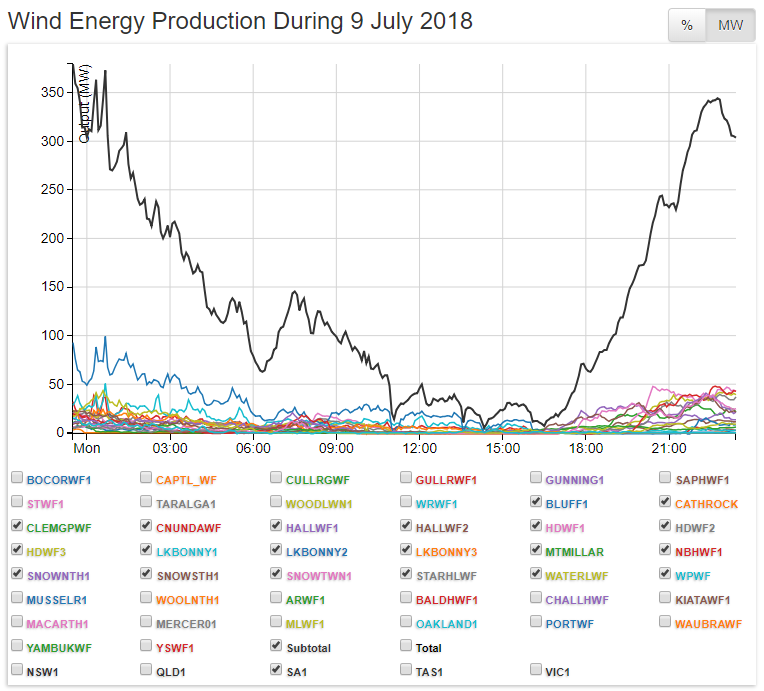 And this is happening when wind generation, although pervasive in SA, is still only a tiny portion of both the five (eastern) state grid and indeed total national generation. According to the federal Environment and Energy Department, wind across Australia supplied 5 per cent of total electricity in 2017, unchanged from 2016. The data also showed coal’s share dropping from 63 to 61 per cent — thanks to the closure of Hazelwood; gas up from 18 to 21 per cent and total renewables edging down from 16 to 15 per cent. Let me talk in broad numbers to explain my two critical points. According to AEMO (Australian Energy Market Operator) data, installed generation capacity in the NEM (National Energy Market, or Australia excluding WA and NT) was around 48,000MW. Coal was around 23,000 of that, gas a little under 12,000, hydro 8000 and wind 4500. Solar was negligible — the solar we do have is not in the NEM but on rooftops. Let us assume we get to the future detailed by AEMO and all the renewables committed and proposed are delivered; solar generation capacity will leap from virtually nothing to nearly 20,000MW and wind will leap to 24,000MW, easily eclipsing coal. So will coal generation capacity collapse? Will all the other stations follow Hazelwood and Liddell into the dustbin of history? Well, actually no, according to AMEO. True, it’s only detailing what’s been announced, and that’s Liddell taking 1600MW out. So is AMEO predicting a dramatic rise in electricity usage? That we need all that extra generation capacity — it incidentally includes an extra 5000MW of gas generation? Well, no, and the answer goes significantly, if indirectly, to the plea from AMEO chief executive, Audrey Zibelman, that we need coal generation for at least the next two decades. The absolutely critical core point is that if actually get to wind generation capacity of 24,000MW, we will need 24,000MW of other — I would call it ‘‘real’’ — electricity generation; critically over and above what those other forms of generation are required to generate on a regular basis. That is to say we would need the equivalent of 10-12 Hazelwoods that would be sitting idle when the wind does blow, just so they could be cranked up when the wind doesn’t. In the fantasy world that so many inhabit, they would be gas Hazelwoods not coal ones, with a few batteries included, including Malcolm’s Big Snowy Battery. 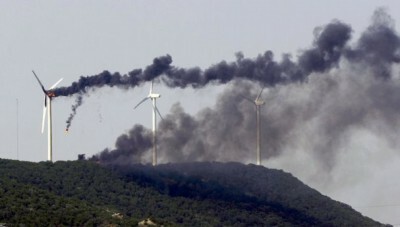 The energy insanity is one thing: building power stations to sit idle, just to accommodate wind. But focus on the utter business unviability. How can anyone justify building a power station knowing that it will have to sit idle somewhere between one-third and half of the time? How could the investor get an adequate return on the cost of capital? Unless of course, they priced power into the grid significantly above the true cost of that form of power generation? In short, the consequence of introducing more and more wind into the system is to force even low-cost forms of power generation become more expensive. And as we saw in SA earlier in the month, that is already happening. My comment last week was attacked on the basis that when the wind didn’t blow in SA there was plenty of gas generation available, but it was bid into the market at ridiculously high prices. The first response is, well, why wouldn’t you: it’s called supply and demand? The more fundamental point is that — without validating the very high priced bids — any owner of a generation facility that only gets to work half the time has to price high. Zibelman indirectly if unknowingly indicated that with her coal call. But she was really only proposing to feed off a legacy free lunch on the investments in coal already made and largely depreciated. That means the depreciated coal plants could, just, sustain a business case, provided they got some guarantee, ACCC-style, of demand; it would do nothing to deal with the market pricing issue. The fundamental need to provide generation overcapacity is already under great stress when we only need around 5000MW of excess capacity — to cover for that 5000MW of wind that can and does completely disappear. Imagine what will happen when we need more like 44,000MW of excess coal and gas generation capacity, having to sit idle when the wind does blow and the sun don’t shine. Surrender Audrey: Coal will be King long after you’ve vanished. Marvellous when someone applies common sense to the unreliables debacle isn’t it? The consumer always gets screwed. The unreliables win no matter what.And the politicians continue to hide their head in the sand! …me know nothing!